The Sounders could have triggered a mechanism as per league rules that could have kept him in Seattle for roughly half his 2018 salary amount. Instead, they let him pursue free agency to see what was out there for him in the MLS marketplace. Sounders midfielder and captain Osvaldo Alonso, the team’s longest tenured player, would have needed to take a pay cut to stay with the team for the 2019 season. That was the implication left by general manager Garth Lagerwey on Tuesday when responding to a question about the team’s decision to allow Alonso, 33, to seek free agency. Lagerwey, speaking during the team’s season-ending wrap-up press conference, said there had been ongoing discussions with Alonso ahead of his not being tendered a new contract prior to the upcoming free agency period. A mechanism within Major League Soccer rules would have enabled the Sounders to keep Alonso – who earned $1.142 million in guaranteed compensation this past season – had they offered him just one dollar above the league-mandated maximum budget charge of $504,375. Instead, he can now explore the market and see whether he can make more elsewhere. For the past three seasons, the Sounders have gradually shifted away from the team that captured a 2014 Supporters Shield for the best overall record in MLS. If Alonso signs elsewhere, the only players remaining from 2014 will be goalkeeper Stefan Frei and defender Chad Marshall. The bulk of the 2019 squad is expected to be led by players acquired in 2016 and later, with forwards Raul Ruidiaz and Jordan Morris and midfielders Nicolas Lodeiro, Victor Rodriguez, Cristian Roldan among the team’s marquee names going forward. Roldan was bumped up to a right wing spot this past season so Alonso could play a starting role alongside Gustav Svensson once he returned from a leg injury last June. Sounders coach Brian Schmetzer has said he views Roldan’s most natural position as a defensive midfielder, though he wouldn’t say Tuesday that it played a role in allowing Alonso to seek free agency. Instead, he said any starting role in the defensive midfield would have to be decided between Alonso and Roldan come training camp – if Alonso were to return. Alonso joined the Sounders for their 2009 season and they are the only MLS team he’s ever played for. “They all know the gig,’’ Schmetzer said. “Ozzie is a very talented player. I can’t think of many other players that have the drive and determination he has shown over the course of his time here. Still, with a plethora of talented attacking forwards and midfielders set to return, keeping Roldan on the right wing in that ever-crowded field makes little sense. 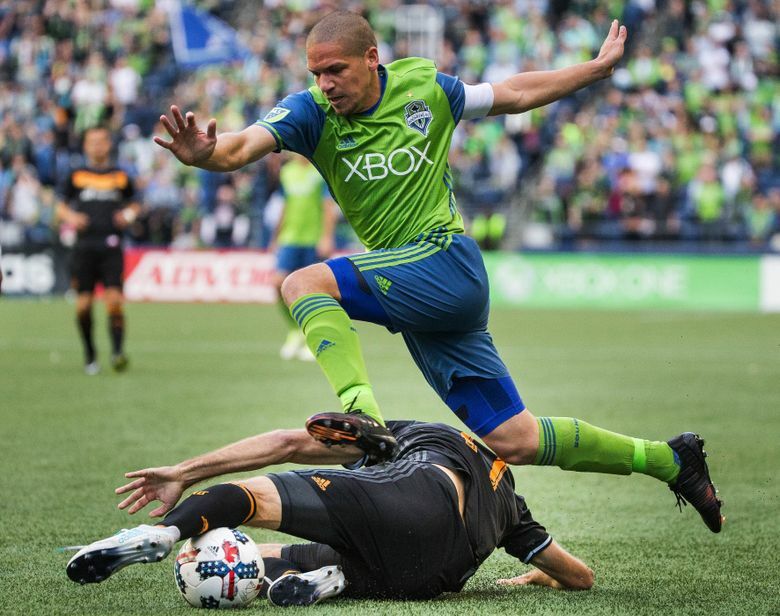 Besides Rodriguez and possibly Morris – if the team decides to stick with a lone forward up top – the Sounders also have Harry Shipp returning for another season and an open designated player slot with which to add additional attacking help if needed. Sounders vice-president Chris Henderson said the team has yet to decide where on the field it will use any added DP or Targeted Allocation Money it chooses to spend. For now, the team that finished 2018 on an historic 15-2-2 run after a 3-9-3 start is largely the one that will take the field next year. Indeed, the return of Morris after a season-ending knee injury could very well be like adding another DP all on its own if he can demonstrate some of the offensive prowess the team expected to see in 2018. Lagerwey said he’s by no means done trying to add players, but added he’s eager to see how the 2018 core does in 2019 given the added off-season rest afforded by a second-round playoff elimination earlier this month. Going to consecutive MLS Cup finals the last two years meant the Sounders had barely a month of time off between campaigns since the end of 2015. They’ll get more than double that this time after the Portland Timbers knocked them out on penalty kicks in a Western Conference semifinal that finished tied 4-4 on aggregate. The Sounders in the second half of the season had rarely allowed more than one goal per contest, let alone the four they surrendered in their two playoff games. “We had really rock solid, veteran guys come in and say they were tired at the end of our season,’’ Lagerwey said. Much of that was from the gigantic hole the team had to dig out of just to make the playoffs. Now, it’s up to Lagerwey, Schmetzer and company to make sure they put the right guys on the field next year to avoid a similar fate.